Both labor-intensive and inactive office jobs can take their toll on your body, requiring the need for electric heating pads. You might not feel it at the time, but once home, you may begin to suffer from aches, pain, tenderness and general discomfort as a result of using your body in a way you wouldn’t typically, or from sitting a certain way for too long. These aches and pains can also become more regular as you age, but it’s not always convenient or safe to take pain medication or to see a massage therapist or chiropractor on a regular basis. Therefore, electric heating pads can provide temporary relief and remove feelings of discomfort. Heating pads are available either as electric, chemical, or hot water, but the most common and often most effective is an electric heating pad. It warms the part of the body it’s placed on, causing blood vessels to dilate and alleviate tissue pain in that area. If you’re tired of aches and pains stopping you from enjoying your time at home after a hard day of work, consider purchasing one of these nine top-rated electric heating pads below. If you’re suffering from aches, pains, sore muscles, or even stiff joints, you are sure to see the benefit in this Pure Relief Electric Heating Pad. This soft, microplush heating pad is designed to increase blood flow, reduce pain, and eliminate muscle spasms just by using it for 20 minutes per day. Whether you’re a regular sufferer of arthritis, or you’ve pulled a muscle, you’re sure to see the benefits of this affordable and easy-to-use heating pad. Just plug it in, opt for one of the six heat settings, and enjoy pain relief in just seconds. You’re sure to notice the aching in your muscles slowly dissipate. This electric heating pad is also in a league of its own due to its extra-large size. It can be conveniently placed anywhere on your body to target the entire surface area and is exceptionally efficient when used on shoulders, arms, legs, your stomach, or your back. If dry heat therapy isn’t working, you can even use the moist heat option, further offering the opportunity for a painless and relaxing experience. Users of this electric heating pad will also love the convenience it offers. To prevent excessive heating or burns, it will shut off after two hours, and it also has a nine-foot-long cord for if you’re not conveniently close to a power outlet. It also comes in a convenient carry bag and is machine-washable to keep it hygienically clean. Neck and shoulder pain and discomfort can be incredibly distracting during your work and home life without an electric heating pad. It might stop you from enjoying the things you love, or it could make you dependent on anti-inflammatory medication to alleviate the pain. However, electric heating pads can remove the need for drugs by providing you with therapeutic heat. 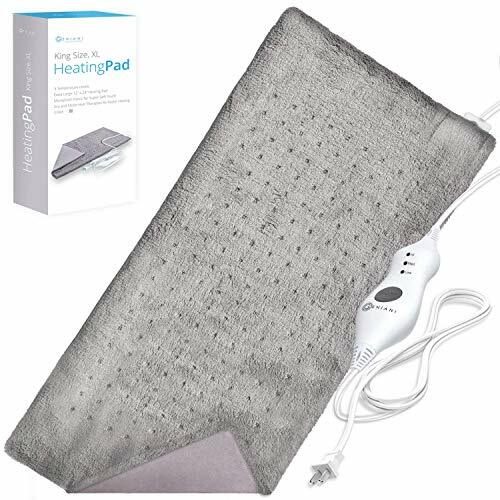 This electric heating pad is contoured to suit the shape of your neck and shoulders and sits comfortably in one place while you watch TV, or just relax with a book. It’s made of micromink fibers, heats in just seconds for almost instant results, and is safe for use in dry or moist heat therapy. For pain sufferers, it can seem like there is no end to the suffering, but this electric heating pad can undoubtedly help. It gives you all the control with four heat settings and provides more in-depth penetration to reach where it hurts with moist heat therapy. It will also shut off automatically after two hours, is machine-washable, comes with a five-year warranty and includes a storage bag, as well. Don’t put up with neck and shoulder pain any longer. Invest in an electric heating pad and notice the difference. If long hours in the office has you rubbing your neck and shoulders in agony, it’s time to turn to an electric heating pad from Sunbeam for help. This specially designed pad for your neck and shoulder region is made from soft microplush fabric which is machine-washable to keep it hygienic and clean. It’s held secure by magnets and is suitable for dry or moist heat therapy. However, for deeper penetration and more visible results, moist therapy is a good option. Not only is it designed to relieve neck and shoulder pain, but it can also be used for muscle stiffness and body cramps as well. Its flexible design makes it suitable to be placed almost anywhere. Four heat settings are also available for your convenience, and it automatically shuts off after two hours for safety. Enjoy the nine-foot cord for connecting to a power outlet anywhere with ease, and relax with peace of mind knowing the manufacturer’s warranty covers it for two years. This heat pad is doing what a standard hot water bottle or anti-inflammatory can’t: provide consistent, pain-relieving heat that doesn’t require you to do a thing. Just sit there, relax, and notice how your aches and pains disappear. Not all electric heating pads are created equally – with some being more beneficial than others, or with higher or lower temperatures. However, this infrared electric heating pad made from microplush with graphene, bucks the trend and provides effective pain relief for almost anywhere on your body. Using graphene technology – a type of heat-conducting material – it emits infrared akin to the infrared emitted by your body. As it is along the same wavelengths, it can often have a better physical effect than standard electric heating pads. This pad also features a low, medium, and high heat setting, as well as an auto-shut off function which comes into effect after one hour for your safety. Due to its size, it’s also suitable as a full body pad, alleviating pain in your stomach, arms, legs, back, shoulders, or anywhere that hurts. Just plug it in, place it on the affected area, get comfortable, and enjoy 20 minutes, or the timeframe recommended by your doctor, of comfortable, pain-reducing heat. This electric heating pad is priced well on the market, is effective as a form of heat therapy, and is well worth your consideration as a means to reduce everyday aches and pains. Add it to the top of your wish list today! For centuries, heat has been considered a valid form of pain relief, and that belief remains today – with the invention of electric heating pads. While our methods at capturing that heat are far more advanced, the benefits of using them are the same. Heat – both moist and dry – can reduce or even eradicate that niggly, uncomfortable ache or pain, leaving you far more comfortable in a short space of time. 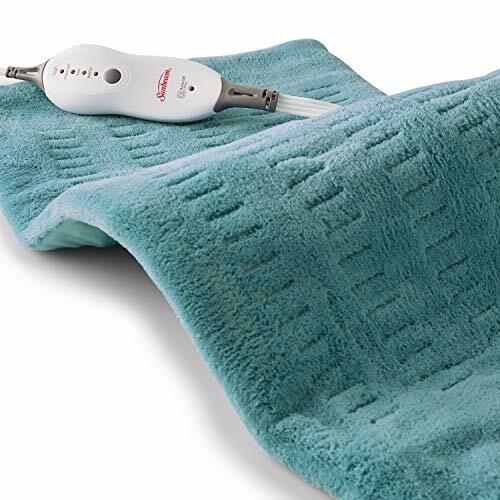 This Sunbeam Xpress Heat electric heating pad is the epitome of effective heat therapy. It uses XpressHeat technology to heat the pad in just half a minute and can offer great therapeutic relief that digs deep with the moist heat therapy option. For those who like to be in control of their heat therapy, the six personalized heat settings will appeal. Just press a button on the LED controller to adjust your level of heat, and benefit from almost-instant relief. This electric heating pad is also in a league of its own due to the area it covers. As a king-size pad, it can efficiently heat up a larger area, enabling you to relieve pain in your shoulders, legs, arms, back, neck, and spine, a lot more effectively. 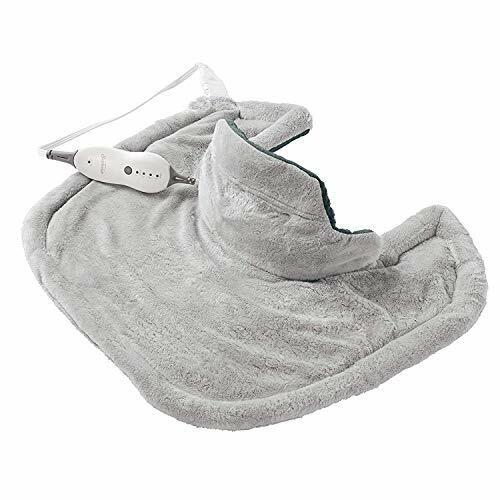 This microplush electric heating pad is also machine-washable and comes with a five-year warranty for your peace of mind. If your standard electric heating pad isn’t doing what it’s supposed to, it might be time to upgrade to an infrared pad from UTK. This heating pad, using negative ions and far-infrared heat therapy technology, is suitable for use on every area of your body. Whether you’ve got arthritic joints or joint stiffness, or you’re suffering from muscle aches and pains, you can rely on this electric heating pad to reduce the pain significantly. Featuring natural Jade and Tourmaline, it’s a more natural alternative to drugs, and it’s also well-made to last for many years to come. Just wrap it around your body, plug it in, and use the smart controller to activate it to your desired temperature. The controller is equally as technologically-advanced as the electric heating pad is. You can adjust both the timer and temperature, and it also has a memory function to remember your preferences. For your safety, it also has an auto-shutoff feature, too. The best part about this electric heating pad, aside from its ability to make the pain disappear, is how versatile it is. If you aren’t able to wrap it around the affected area, you can lie on it, or sit it on you, as well. However, when you do prefer to wrap it around an arm, shoulder, or another body part, it has convenient velcro straps to allow you to do so. The sky is the limit with this heating pad. Start the journey to being pain-free with UTK today. If you want fast, effective pain relief without relying on medication, this FitFirst Electric Heating Pad could tick all the boxes. Unlike many other heating pads on the market, this one is a large size blanket that can drape over your shoulders to hit several areas of your body at once. It is the ultimate provider of heat to alleviate pain in minutes. It heats up in just 10 minutes and reaches its premium temperature through a thin layer of clothing in just half an hour, with two vibrating massage heads that massage tense muscles with the additional benefit of heat. 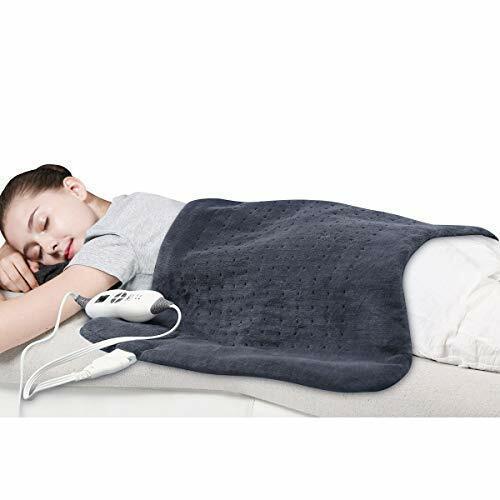 This electric heating pad is also beneficial in relieving tightness and fatigue in muscle, while encouraging blood vessels to expand, as well. For added convenience, the cord is also 9.8 feet long, meaning you don’t have to be near a power outlet to feel its effects, and the vibrating effect turns off after 15 minutes. Whether you’re at work or home, this electric heating pad from FitFirst will provide much-needed relief, helping you to work to your full potential without any pain. 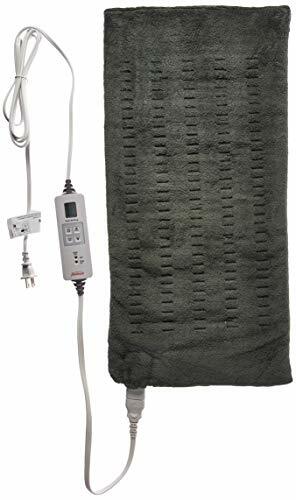 If you seek immediate relief from muscle and joint pain, or even conditions such as fibromyalgia, multiple sclerosis, and rheumatism, this MediCrystal Far-Infrared Electric Heating Pad is a good option for you. 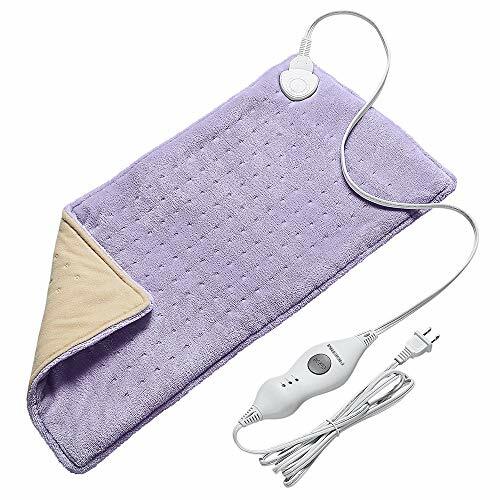 Unlike many other heating pads that merely heat the affected areas, this pad uses purple amethyst crystals to emit far-infrared and negative ions for deeper penetration into the targeted areas. Being such a long mat, it can be used for many areas of pain at once and helps to detoxify your body while providing many natural healing benefits as well. Some benefits include helping with stress, anxiety, fatigue, depression, insomnia, improving metabolism and blood circulation, and boosting your immune system. In the process, you are also protected from electromagnetic fields, and instead get to enjoy therapeutic results without drugs or alternative treatment methods. This electric heating pad is more than just a soother of aches and pains; it’s a natural healing pad that targets your physical and mental well-being all in one. 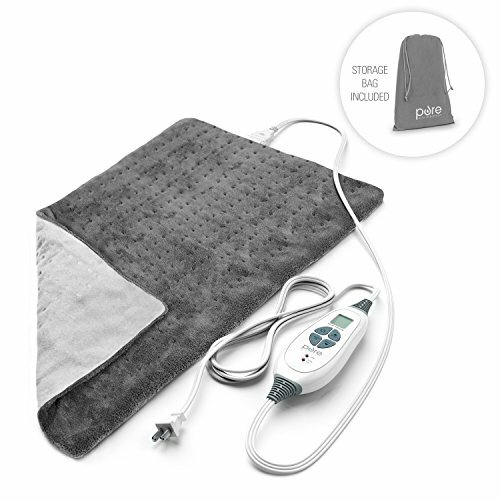 While this electric heating pad is not the most affordable option on the market, it is one of the best, with scientifically proven healing methods to give you additional peace of mind. If you’re sick and tired of aches and pains and generally feeling under the weather, it might be time to turn to MediCrystal. Most electric heating pads for sale offer two types of heat – dry and moist. However, the most beneficial form of heat, the one that penetrates into the target area with far more efficacy, is moist heat. BodyMed supplies a high-quality moist heat heating pad designed to alleviate pain and suffering caused by joint stiffness, sprains, strains, and inflammation. You can benefit from temporary pain relief, all without the hassle of filtering water into a device to create moisture. This electric heating pad requires no water and, instead, uses the humidity in your surroundings to create its own moisture. You can then control the temperature you prefer, and the time you wish for it to provide the heat, using the digital LCD monitor – before locking these in for 15 minutes of use. This BodyMed heating pad is a high-quality product designed to deliver premium levels of therapeutic warmth for beneficial pain relief.